Long Range Secondary Receiver Package contains everything needed to open your gate from up to 1500 feet away depending on conditions. This receiver can be used simultaneously with the existing receiver that comes with the gate opener. The remotes that come with your gate opener will still continue to work at their normal range and the long range receiver and remote (or multiple long range remotes if you purchase additional long range remotes) will work from the long distance. This is handy to have to open your gate from the house without having to run wire for a push button or intercom. (it is always recommended that you have a view of the gate and any obstacles before activating it for safety purposes) It is also great for overcoming a poor radio frequency area where you have tried short range remotes to no avail and need a stronger signal to open your gate. Each comes with a visor clip (removable), LED indicator light and an antenna. 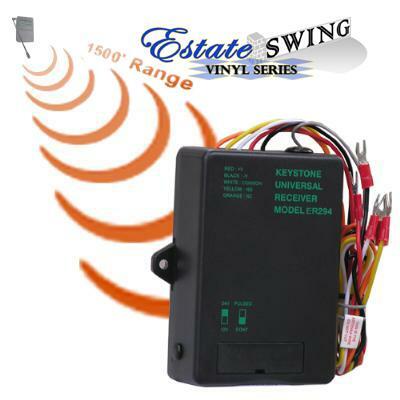 The receiver is easily wired in using a 4 wire connection to your Estate Swing vinyl gate opener and is conveniently powered directly from the control board.